CFL User Guide for CFL general procedures and as a general FAQ/help resource. Winter Sampling at Trout Lake Station form must be completed 3 days before planned field work. NOTE: Training may be required; please plan accordingly. The University of Wisconsin-Madison prohibits acts of sexual harassment, sexual violence (including sexual assault, dating violence, domestic violence and stalking) and related retaliation in all educational programs and activities. For more information and resources, please see Hostile & Intimidating Behavior or Sexual Harassment and Sexual Violence. You are also more than welcome to speak with the director at Hasler Lab or Trout Lake Station or any staff member about concerns you may have. 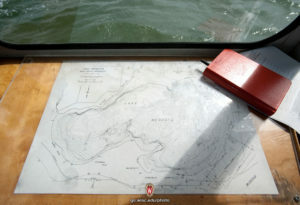 FINDING YOUR WAY AROUND THE CFL A chart map of Lake Mendota is pictured aboard the 1967-era, 28-foot University of Wisconsin-Madison research boat on July 17, 2009. The photo was made during a Grandparents University (GPU) limnology class outing, led by John Magnuson, professor emeritus of zoology and director emeritus of the CFL.